POSTCARD stands for "Police Officers Striving to Create and Reinforce Dreams"
How to abbreviate "Police Officers Striving to Create and Reinforce Dreams"? What is the meaning of POSTCARD abbreviation? 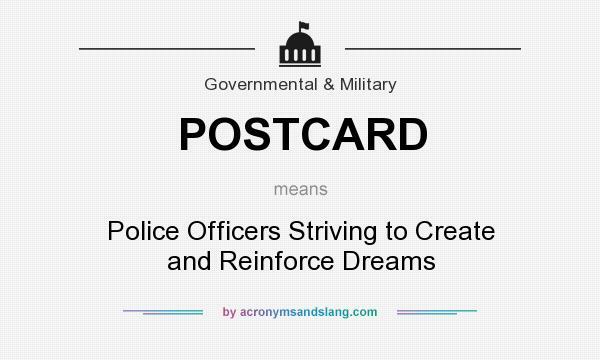 The meaning of POSTCARD abbreviation is "Police Officers Striving to Create and Reinforce Dreams"
POSTCARD as abbreviation means "Police Officers Striving to Create and Reinforce Dreams"